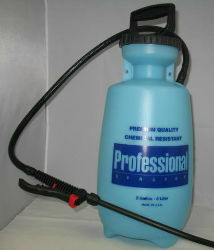 Heavy duty construction and commercial quality, this quality sprayer will last years. Easy to clean; just rinse it and run some warm water through the hose and tip. Features include: Chemical resistant Viton® components Easy fill funnel top is extra wide to reduce spilling and waste. Pin-to-cone tip Fan Spray tip included Translucent tank Fully repairable Galvanized steel pump rod for extra strenth. Duralbe Chemical resistant poly trigger action grip.Thumb latch locks forward for continuouse spray. Heavy Duty extention wand rotates 360 degrees. Adjustable nozzle for spraying fine mist to a 3oft. stream. Removeable nozzel base for easy cleaning.Nozzle can be attached directly to shut-off.Braided reinforced PVC hose. Convenient wand storage clip.Maintenance-free poly pump for dependable, easy pressurization.Long lasting poly plunger cup for reliable performance.Tank graduations for easy measuring, mixing and filling. Non-rusting, super strong, high density polyethylene tank.